As there is still considerable uncertainty on storm track and intensity, this forecast WILL continue to change through the day Thursday and Friday. Stay tuned on Mountain Wave Weather for continued updates! Snow looks to come to an end by noon on Saturday with clearing conditions. 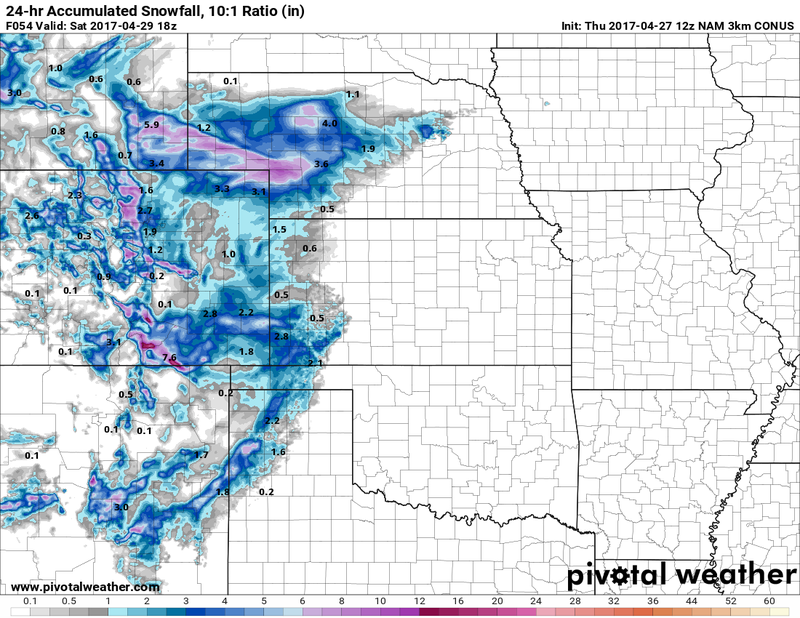 With current modeling guidance, there is a POTENTIAL for significant snowfall amounts to impact travel, mainly for areas South of Denver. 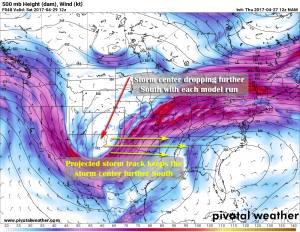 Models are still jumping around a major storm and a non-event for this storm system. 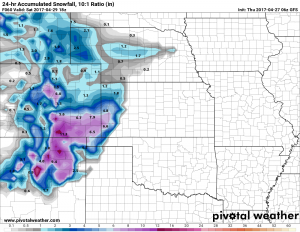 I suspect that this is due to how difficult these spring storm systems are to forecast, but if we throw out the models and look at the pure meteorology, I’m not sold on a major snow producer out of this storm just yet. I talked about this in last night’s post, but this storm has some similarities to the past couple we’ve had, which means my forecasting bias is on less snow rather than more with this storm. As we continue to get more model data in throughout the day we’re noticing a very familiar trend. 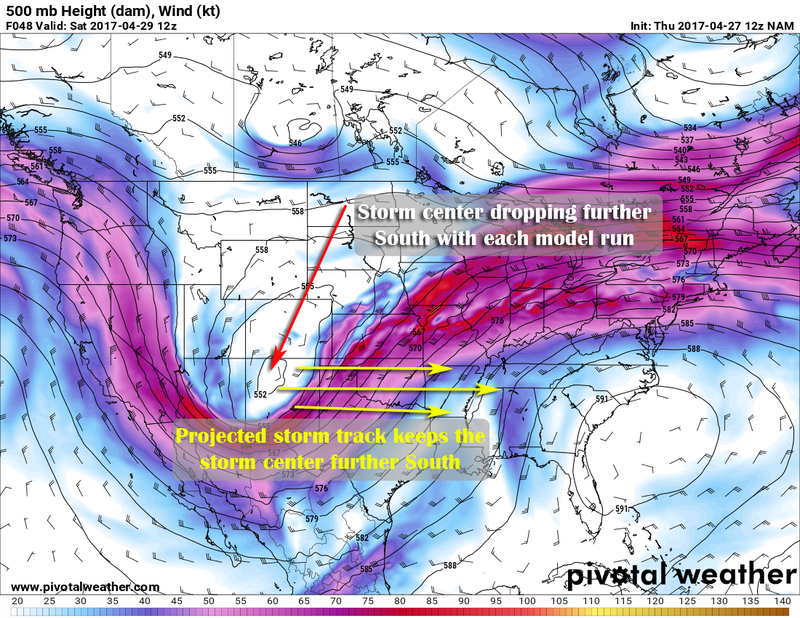 Most models are showing a southern bias to the storm system… this is exactly what happened with the past 3 storm systems that hit our area. If you recall, they were all projected to drop major snow all the way until the last minute but then, took a quick jump to a non-event. This storm system is showing similar tendencies, and while no two storm systems are the same, we can’t help but notice this trend. It will need close watching over the next 24 hours to see if we see the models significantly scale back snowfall. At this point in time, the models are still holding on to a decent sized storm out of this but I’m not sold just yet. We’ve seen scenarios too many times like this in the past month or two that don’t pan out and the pure meteorology doesn’t support a big storm with this just yet. Can things change? Absolutely, forecasting this time of year is very fluid so expect our forecast and event the National Weather Service’s forecast to change in the next 24 hours. Be prepared for bad weather Friday night into Saturday morning, mainly travel difficulties South of Denver. 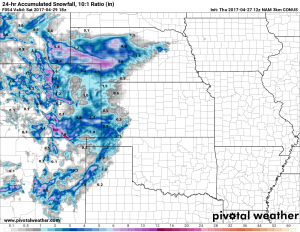 Significant snowfall is POSSIBLE but not set in stone just yet. Just be aware that we may or may not see big snowfall accumulation with this storm. The cold will be the big story here! Damage to sensitive vegetation and sprinkler systems is likely Saturday and Sunday night. Drain your irrigation systems or cover the pipes and cover sensitive plants. Stay tuned for latest updates on this forecast on our site and Facebook page! Thank you for following along and for all the support!